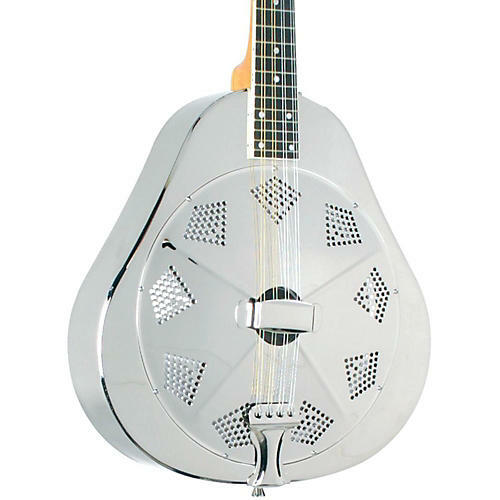 The Recording King Metal Body Mandolin is one of the only mandolin resonators available today and the instrument with the most similar characteristics of the pre-war originals. Choose from the nickel-plated bell brass finish, the nickel-plated bell brass finish, with "Lily-of-The-Valley" back engraving, or the champagne matte finish, while they last. This unique Recording King mandolin has a nickel-plated bell brass body, 10" hand-spun Continental cone and a beautiful pearloid headstock overlay. This Recording King mandolin has power, projection and style. With the Lily-of-the-Valley back engraving, 10" hand-spun Continental cone, and a beautiful pearloid headstock overlay, the resonator mandolin looks and sounds like an antique, custom mandolin. This unique mandolin has a matte champagne-finish, nickel-plated bell brass body, 10" hand-spun Continental cone, and a beautiful pearloid headstock overlay.